I have been enjoying Philippa Gregory's book since last year. 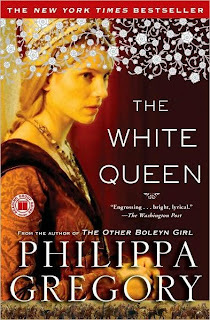 I read "The White Queen" and instantly became obsessed with reading all of her books. They are historical fiction, yet they are written so well, you feel like part of the story. Her writing style is easy to follow and very descriptive. While reading her books, I could actually visualize the scenes. So, you can only imagine how thrilled I was when they announced the series on Starz based on three of her books: The White Queen, The Red Queen and The Lady of the Rivers. The first episode was this past Saturday and it did not disappoint. I was happy that they stayed true to the book. I definitely recommend watching the series. It's on Saturdays at 8pm on Starz.